Swedish Ericsson and Finnish Nokia both announced they’re losing people as the endless winter nights take their toll. Ericsson’s SVP, Chief Marketing and Communications Officer and Head of Marketing and Corporate Relations, Helena Norrman, is calling it a day after 21 years at the company, with ten of those on the executive team. She’ll be hanging around for a quarter or two, to keep the transition smooth and presumably have a hand in finding her replacement. On a personal note, I got a chance to hang out with Helena when I was over in Stockholm last summer and found her to be smart and tough, but at the same time friendly and approachable, in other words great at her job. I’m sad to see you go Helena, but wish you all the best with your next thing. 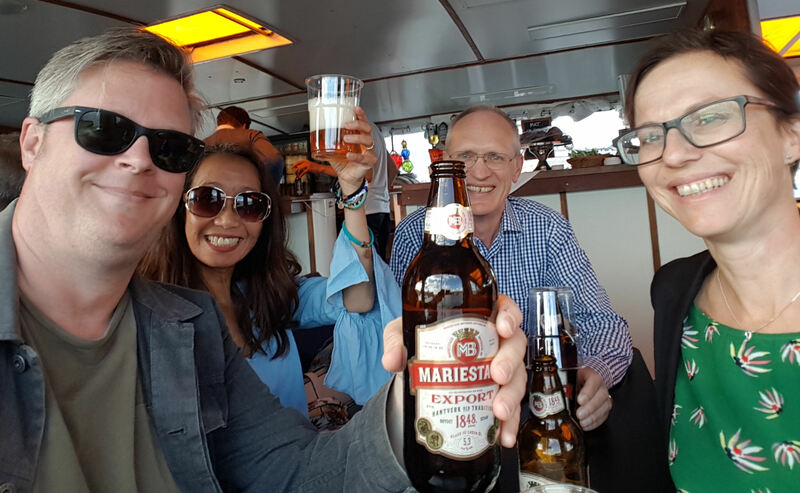 Here were are getting the beers in, on a boat in Stockholm, with Helena on the right. “Nokia has made good progress in executing on its strategy, with momentum in providing high-performance end-to-end networks, targeting new enterprise segments and creating a standalone software business. Our early progress in 5G is strong and we continue to increase our investment in this critical technology. On one hand any job loss announcement sends out the message that the company is struggling to make a profit. But as Uitto noted, this sort of thing is not uncommon among kit vendors and Ericsson has been on a massive downsizing of its own, so these 350 redundancies need to be kept in perspective. Meanwhile Norrman’s departure is a loss to Ericsson, but maybe it will take this opportunity to get someone in from the outside with a different perspective on the company. Sad to see such great and innovative companies of hundreds of years behind them – today struggle to survive in an ultra competitive world, rapidly changing marketplace being greatly disrupted at every turn and at every second of the day. The mainland Chinese companies have stolen blatantly a lot of proprietary data and intellectual capital from a number of leading western companies thus giving them an enormous edge and dishonourable advantage over the respected likes of Ericsson and Nokia. The West must push back by boycotting the Chinese companies and supporting homegrown entities which will spur greater innovation and safeguard precious jobs. The mainland Chinese state owned companies do not ever play by the rules or seem willing to change their modus operandi. I wonder if you’ve always blamed one Chinese company for every 100yr old western company bankrupted. Do you know how slow that people work in those Nordic companies and how hard Huawei people work overtime, even though it’s not appreicated by Western moral standards. And if you have a bit depth insight on technology leadership in ICT industry today, you’d have know that Huawei is about 18-24months ahead of Ericsson and Nokia. Surprisingly they still manage to make it with much lower cost , otherwise you’ll end pay 5-10times more for your cellphone monthly subscriptions now. It’s easy to copy than develop new products and it will be cheaper too to copy and reverse engineer or add minor things to it. Huawei products are ahead of the competition by at least 12 months. Hence why western media is running a smear campaign against the company instead of competing on merit – because they know they can’t win without propaganda. Actually, Huawei spends a lot more than Ericsson and Nokia combined on R&D, and are technologically ahead of them. There is nothing for Huawei to steal from these companies any more. Instead Huawei is a big R&D contributor to Open standard bodies. Once their standards are adopted by everyone, they outcompete Western companies by their cheaper manufacturing costs and mass production capabilities. Their advantage comes from lower labour rates, large pool of STEM graduates and the size of their local market which gives them economies of scale. The people in the industry know well that once you get the basic technology for free , it is much easier to develop the next generation as somebody payed for the mistakes already. Huawei is great in stealing technology and what is even more valuable the talent that is then transferred to the Chinese. They utilize the fact that European governments support the Universities and get the western education with little investment or even supported by Chinese scholarships. An absolutely unfair situation was create over last years in OSS/BSS market , that Huawei, ZTE and other Chinese telecom vendors created by empty promises and unclean business in Europe and other places, with heavy political and financial support of their government. On the surface attractive deals caused many providers to move to them and all pay now a very heavy price of delays, price increases after the deal and solutions that do not work. With the recession today it is not difficult to invest temporary in R&D more than Ericsson or Nokia. The dependence on China already has political consequences in Africa and I am afraid that the Old World undermines the real unspoken targets of the Chinese Government. Why are western companies not allowed to act freely in China? Why is getting a work permit in China for a foreigner a nightmare. Why are there financial limitations on how much capital can be taken out of China? Why is it almost impossible to buy property for a foreign person or company in China? It is completely nonsense to put all the blames on the Chinese firms. If you have made research or study in China to see how these companies are competing in China markets and how much innovations we have made WITHOUT GOVERNMENT support or sponsorship. Look at all your so-called WESTERN companies, big promise but less innovation, ignorance, arrogance, how can you survive in the market? None of the network vendors are any good in providing software solutions and implementation services around BSS and OSS. Nokia gave up and sold off their BSS business to your Redknee in 2013. Ericsson have not really managed to merge their BSCS acquisition into a converged billing system and most of their LHS people are gone. They have also been struggling in BSS/OSS in recent years. You are partially right that Huawei created an unfair situation in the BSS/OSS market, but it through gross incompetence rather than dirty tactics. They actually poured in a lot of effort and over-investment to build up their solutions and services in this area, which is really not commensurate with the returns. You can think of it like the Chinese companies (e.g. Ofo) over-investing in the bike sharing business and now going belly up. As for outright stealing technology, I have not seen this in their BSS/OSS. Rather, their playbook has been to hire foreign experts (and pay top dollar) and try to gain knowledge transfer. As for delays and solutions that do not work, Huawei is not the only culprit, Ericsson has also a fair share of these problems. Even the Consulting and SI boys like Accenture and Wipro have their failures. The problem with the transformation projects for European telcos is that their legacy systems are really dated, heavily customized (e.g. bastardized BSCS v1 still being used) and fragmented (e.g. more that 500 core and non-core business IT applications). I have not worked in China in recent years and do not know anything about the work permit, property and financial restrictions that you mentioned. I was however involved in one of the first Western BSS implementation for a Chinese telco in the 90’s and we conducted our business through Hong Kong. Regarding R&D cost, Huawei used all customisation work as R&D cost by flying 30 to 40 admin, fresh engineer, reporting manager, etc as R&D staff to any country to fix and show to customer, their are here to fix the bugs, intergration, migration and testing. No, customization is still done in China and not onsite. They do send a land team of people onsite for requirements capture, testing, integration, configuration, bug fixes (code development is still in China), migration and cutover support. Their whole concept is highly inefficient and gives rise to a lot of problems during projects.